Speed of delivery? Increased efficiency? Adding more black to the bottom line? 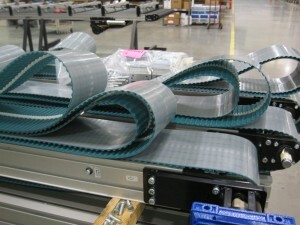 What do you look for in a conveyor manufacturer? While attending Pack Expo in Las Vegas this week, stop by Dorner’s booth No. 3308, and learn how we can do all that, and much more, for your next application. Reduce product loss – see how our smooth transfer points and conveyor design eliminate product damage. Increase throughput – get more out of your conveyor system and improve your bottom line. Fast and accurate product movement – our conveyor systems can move virtually any product in the harshest environments quickly, safely and efficiently. Drive product speed and project speed – watch your production skyrocket with belts traveling as fast as 250 feet per minute. 3D CAD libraries – draw more precise conveyor dimensions in 1/8″ increments for realistic depictions. Build-to-order with Quick Delivery – need a conveyor system built to your specific dimensions and operating in just a few days? No problem. Supported by Knowledgeable Team – have questions about your conveyor system? Give us a call day or night – we’re ready to assist you. Responsive service/FIT Team – we’ll come out to your facility for free to ensure the conveyor system to operating to its peak performance. Look forward to seeing you at the show next week!